My husband and I love spending time in the garden, especially when it's a sunny day. 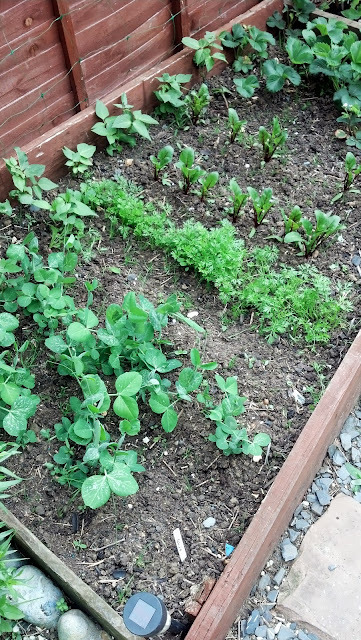 When we first moved into our house our little garden was nothing but mud but now it is a mixture of flowers, veggies and herbs. 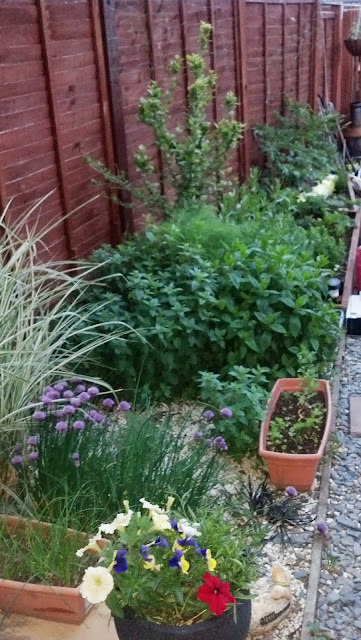 We've spent the best part of the last 3 years trying to make the most of a small garden and I promise it can be done. I thought I would share with you a few pictures about how it can be achieved. 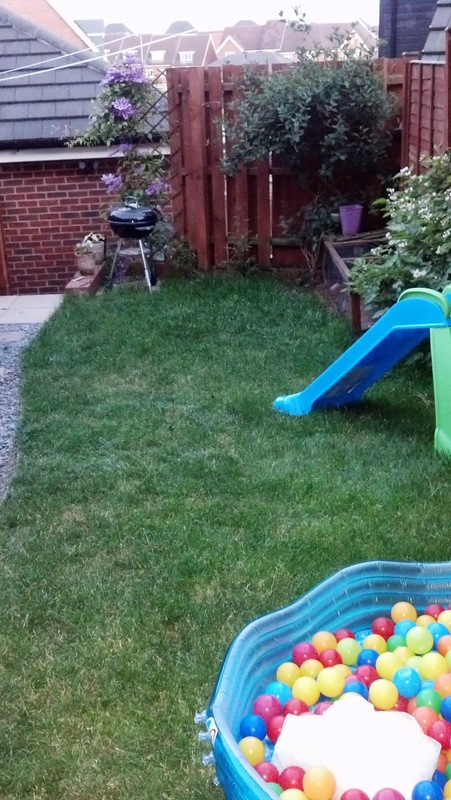 Right hand side with lawn grown from grass seed. Chicken coop in bottom right. On the back fence a Clematis & Honeysuckle. Everything you see in the pictures we planted ourselves, we really have tried to make the most of the space and grow lots of things. The only thing I insist is that I'm allowed a few flowers to brighten the garden up else it is very green! Let me tell you what we grow. In our herb patch pictured above we have mint, tarragon, chives, rosemary, thyme, sage, oregano, marjoram, fennel and occasionally basil, parsley and coriander in the tubs. The herb patch does brilliantly and goes on for quite some time even on the approach to winter. 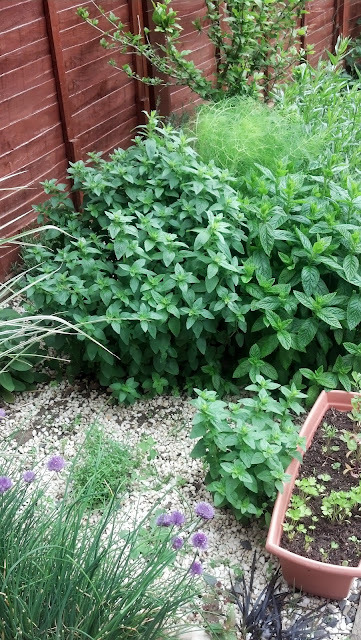 The mint is especially useful for making Mojitos! One tip about mint, it grows like mad so plant in the actual pot in the ground so it doesn't take over too much (Helly's top tip!). 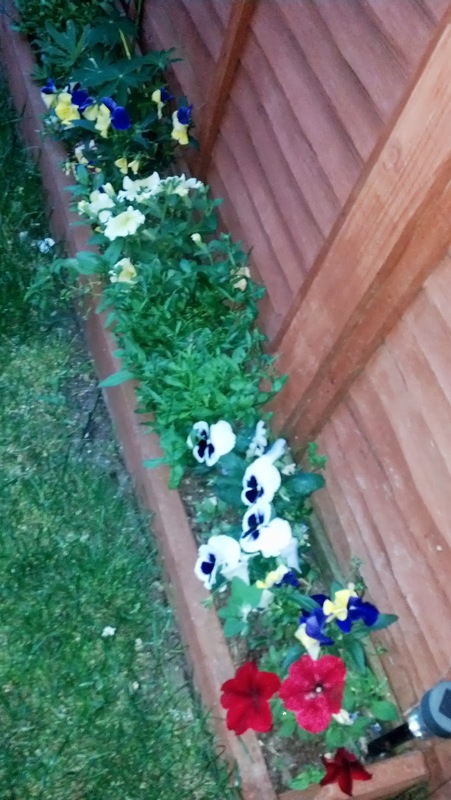 This is my planter to the right hand side of our garden, this is where I'm allowed to grow lots of pretty flowers! This year I have chosen to grow pansies (always successful in our soil), petunias and trailing lobelia (very pretty when established). 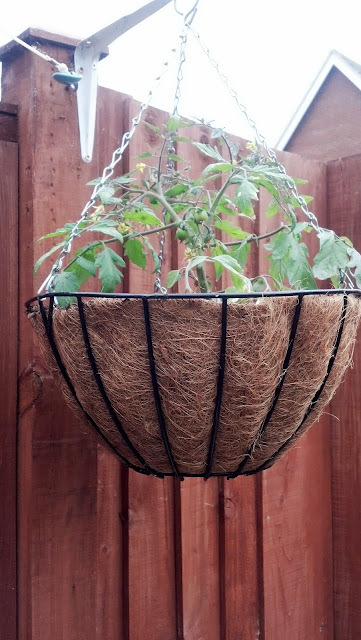 To make use of all the space I use lots of pots and a drain pipe pot which is pictured below (an excellent space saver for small gardens). I also have some trailing lobelia at the front of the veg patch, I usually have sweet peas to which grow up so excellent for small gardens. 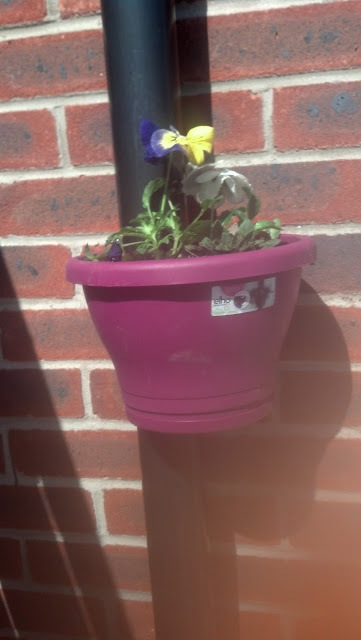 Drain pipe flower pot (picture taken last month) Great space saving idea! 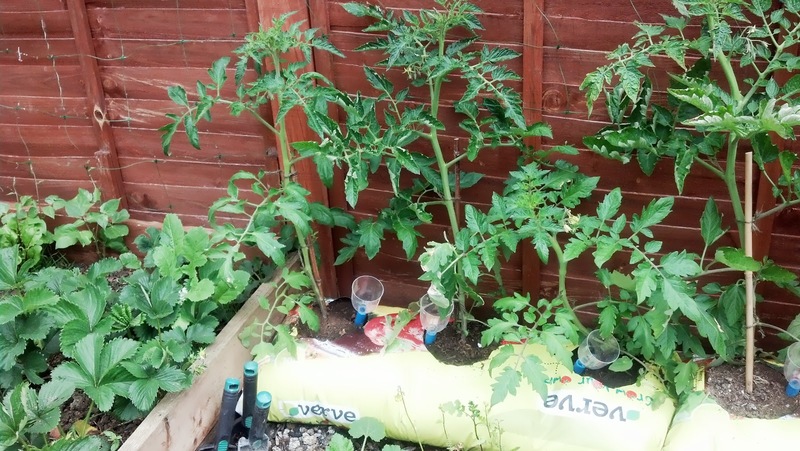 In our veg patch this year we are growing lots of yummy stuff, we are trying a couple of things we haven't grown before so fingers crossed we are successful. We are growing carrots, peas, beetroot, runner beans, courgettes, radishes, tomatoes, lettuce, rocket and strawberries. 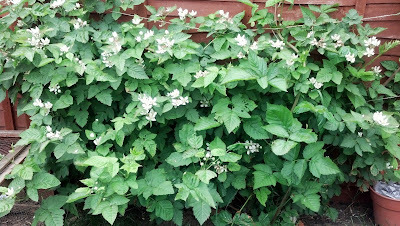 This is a boysenberry bush that we are growing on the right hand side of our garden up against the fence, it's in its 3rd year now and starting to really establish. It produces fruit that are a mixture of a common blackberry, a raspberry and a loganberry. The berries are really lovely, I'm hoping to get quite a lot of it this year! 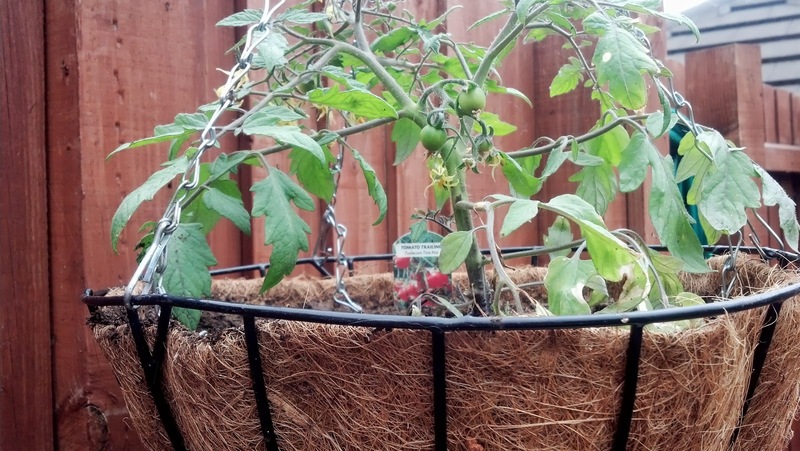 Pictured above is another new addition in the form of tumbling tomatoes, I think this is a fantastic idea if you're short of space and costs about a tenner for the whole thing! Looking forward to seeing how this goes during the summer. Mr pride & joy. A 'Dr Ruppel' Clematis. 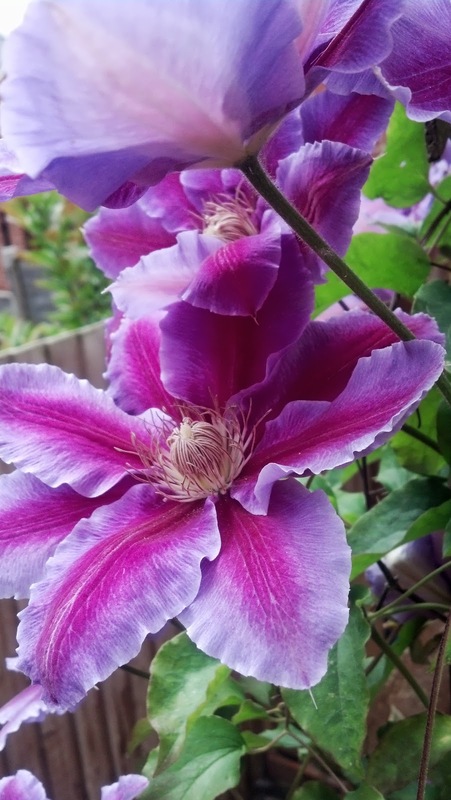 The clematis is my pride and joy in the garden, it adds a beautiful burst of colour during the summer months and the flowers as you can see are simply stunning. I find it so satisfactory growing our own fruit, veg and flowers. I'm not a great gardener and our garden is small but I'm proud that we've made the most of the space we have, even if you don't have a garden it just goes to show there are ways to grow lots of different things. If you want some more advice on starting your own veg patch or growing plants then you must check out this excellent website Grow Your Own, it's got loads of great articles, hints and tips to get you started, and of course if you want to ask me any questions then please get in touch! 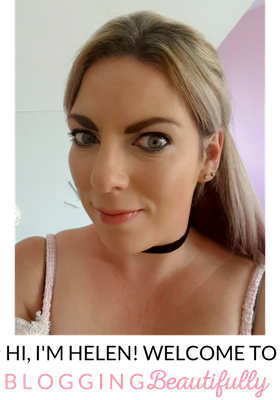 Sorry about the picture heavy post, I thought it was best instead of me rambling on and on! Helly's Top Tips: The drain pipe planter is available from Homebase for £6.99. Many of our plants and flowers are bought from our local garden centre and plant sales which are always worth looking out for. 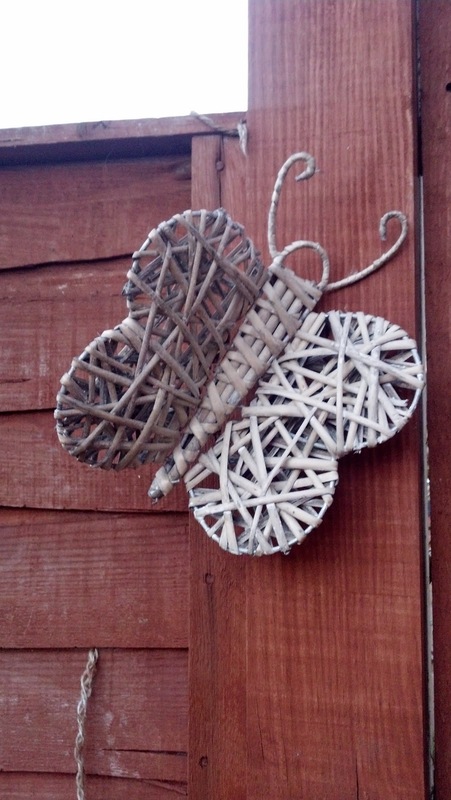 The butterfly decoration is also from Homebase. 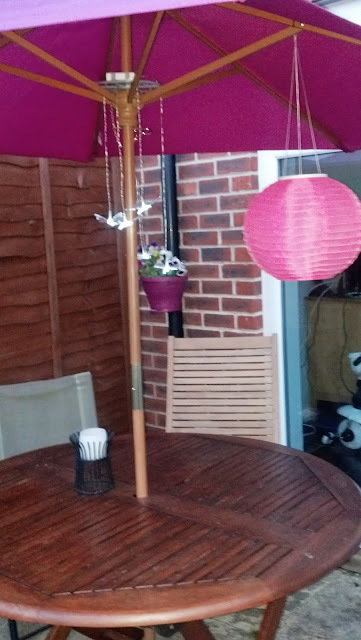 The butterfly LED lights, pink lantern and pink parasol are from B&Q . 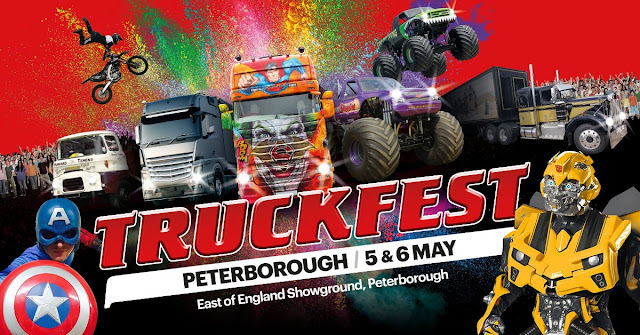 * Please note that this is a sponsored post. Thank you so much! It's quite overgrown with all this rain and then sun but we're not going short on herbs that's for sure! Possibly the best bread & butter pudding?